PetVille is showing its longevity, being one of the first pet-themed games to hit the Facebook scene in 2009. 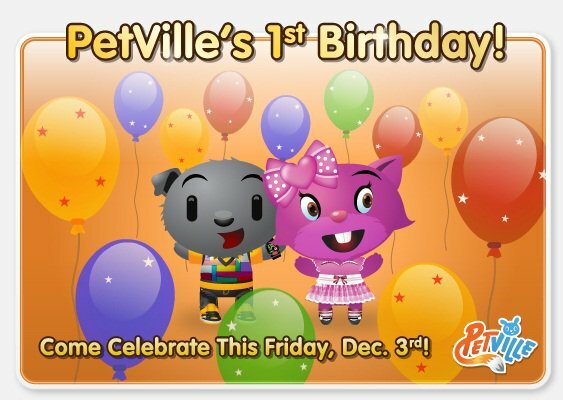 On Friday, December 3rd, it's PetVille's first birthday and Zynga has invited players to come celebrate on that day. We have absolutely no idea what to expect for the cute game's first anniversary. Could it be free Pet Cash simply for logging in? Maybe there will be balloons and new birthday items available to buy in the store? A new minigame, or a new theme? We really have no idea and PetVille sure haven't divulged much in the way of dirty details. All we know is that you can celebrate by logging into PetVille this Friday, and that you "won't want to miss out". This could mean a lot. What kind of birthday celebration are you hoping that PetVille will host on Friday? Sound off in the comments!